Originally designed for use on the highways and now adapted for use within play and recreational areas, durability is the key property of this material. Manufactured from a combination of granulated plastic and glass bead, the material is non-toxic, non-slip, colour fast and extremely durable. Unlike paint or powders which fade and become unsightly over a short period of time, the thermoplastic material does not. Once installed, you can expect your markings to be looking good a remaining functional for many years to come. The material is NON toxic complies with BSEN1436. 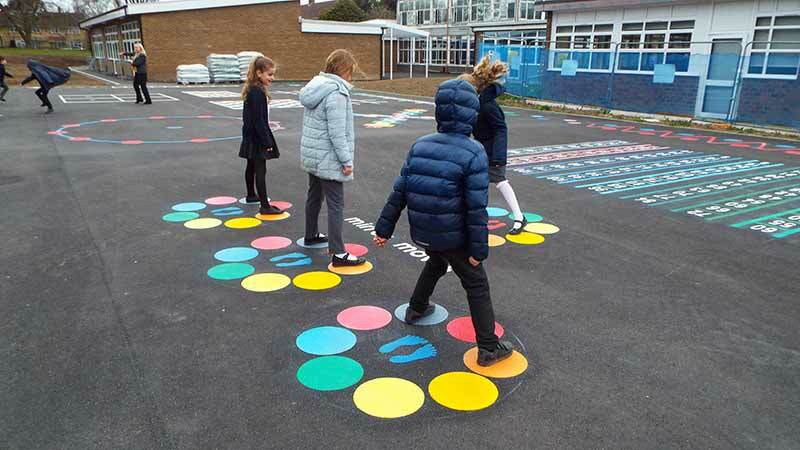 Our Project Playgrounds Anti-Slip Thermoplastic material has been especially formulated and SATRA tested up to a million cycles and fully conforms to BS7976-2 making it the most durable thermoplastic Anti-Slip treatment for pedestrian traffic available today. Further testing of the material saw our thermoplastic out perform any current anti-slip products resulting in its increasing popularity for all areas and surfaces prone to slip problems especially on checker plate, worn or smooth concrete, wood decking, tiled surfaces, aluminium ramps etc. The main two differences between Project Playgrounds Thermoplastic product and that of other Thermoplastic products are simply; better surface adhesion due to its formulation and the ability to apply a variety of different high friction aggregates at the time of installation. Traditional anti-slip treatments such as anti-slip paints, tapes etc whilst providing an initial solution, are simply not as durable as thermoplastic, resulting in repeated applications, and the additional expense and disruption that this can cause. The Project Playgrounds Thermoplastic Anti-Slip Product however is flexible on installation, retains its Anti-Slip properties throughout its life, is easily manufactured to any design, is available it 18 different colours, and can be applied to almost any surface substrate, and most important of all, it is a very cost effective solution. The Project Playgrounds Thermoplastic Material is without doubt the best and most durable thermoplastic on the market today. Start the process now by upload your artwork using the two part form opposite. If you have any questions you would like to ask us regarding our markings or the installation process please feel free to contact us on the below telephone number or send us a message and we will reply as soon as possible.